When someone else’s driving makes you feel unsafe, you have the responsibility to speak out. Speaking out empowers—we call them who speak out empowered passengers! How do you speak out when someone else’s driving makes you feel unsafe? Shoot a short video. Tell others a story of passenger-empowerment. History or fiction. Be creative. Entertain, but be sure to instruct as well. Post a link to your video on Instagram or Twitter along with the hashtag #EmpoweredPassenger. On the contest gallery page, enter the Youtube URL in the form. 11:59 PM on 19 August 2017. As determined by a group of judges, the cleverest, most creative video will win its maker two AllSport Passes to the U.S. National Whitewater Center. A member of NC Vision Zero team will email the winner once judging is complete to obtain a mailing address. Do not film while behind the wheel, even if the vehicle is stopped. Do not film others without their consent. Do not break any laws, ordinances, regulations, etc. Only current residents of North Carolina may participate. Violating any of these restrictions will disqualify you, so watch out! You retain ownership of your work. By submitting, you implicitly grant ITRE the right to use and distribute your work for any purpose related to the NC Vision Zero initiative, including on its website and social media accounts. Many civic institutions collaborate in pursuit of NC Vision Zero’s goal. They are all dedicated to eliminating roadway fatalities in North Carolina—but real, positive change requires conscientious citizens like you. Keep up the effort! Check out our website at ncvisionzero.org for more information and resources you can use to help make our roads safer. A motorist in Charlotte stopped on the highway to avoid hitting carpet padding that had fallen from another vehicle. The stopped car was struck from behind, causing the vehicle to hit the concrete barrier and catch on fire. Four passengers were injured and the driver was killed. In Nash County, a motorist swerved to avoid a wooden pallet in the roadway, ran off the road, and overcorrected. The vehicle overturned several times and the crash killed the driver. Click here for a brochure of NCDOT’s recommendations. On the road, any debris or flying objects can pose a danger to motorists. Between 2012 and 2016, there have been 2,595 crashes from unsecured loads – resulting in 705 injuries and 14 fatalities in our state. 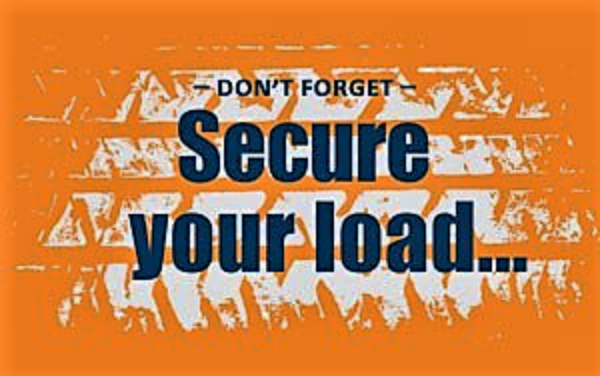 To raise awareness about this issue and prevent crashes resulting from loose items, Governor Roy Cooper has declared June 6 “Secure Your Load Day” for North Carolina. This is an effort to make sure all vehicles are properly loaded and our roads are clean of dangerous debris. Make sure everything in your vehicle is tied down. Use straps, twine, bungee cords, netting or rope. Be sure to tie larger items directly to your vehicle. Keep your items covered with tarps, nets or covers to keep smaller items from flying out. Don’t overload your vehicle. Your vehicle’s load shouldn’t go above the level of your truck or trailer and all items should be covered to keep them stable. North Carolina law requires that all materials being transported in a motor vehicle are securely tied down. Failure to properly secure items can result in a $2,000 fine and a point on your driver’s license. If you are carrying loose items, take the time to properly secure your load. They could have been here—the 1,442 human beings killed last year on North Carolina roads. On the World Day of Remembrance, a pair of shoes, still, empty, stood for each one. 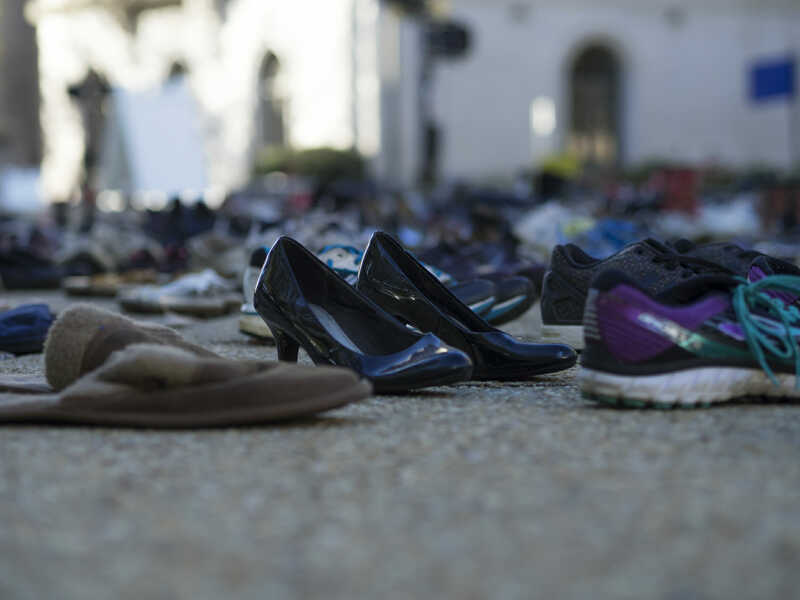 To honor them, and to expose the dire cost of unsafe driving, NC Vision Zero set out those shoes in front of the State Capitol in Raleigh on November 19, 2017. NC Vision Zero’s Second Annual World Day of Remembrance Exhibit, November 19, 2017. For, each one of those 1,442 human beings was loved–and deserved better. Some passers-by offered a paper flower, remembering someone they loved in particular. They placed a flower on a pair of shoes, as if to suggest some good may yet come of this, if only the people were more aware of this serious public health issue. 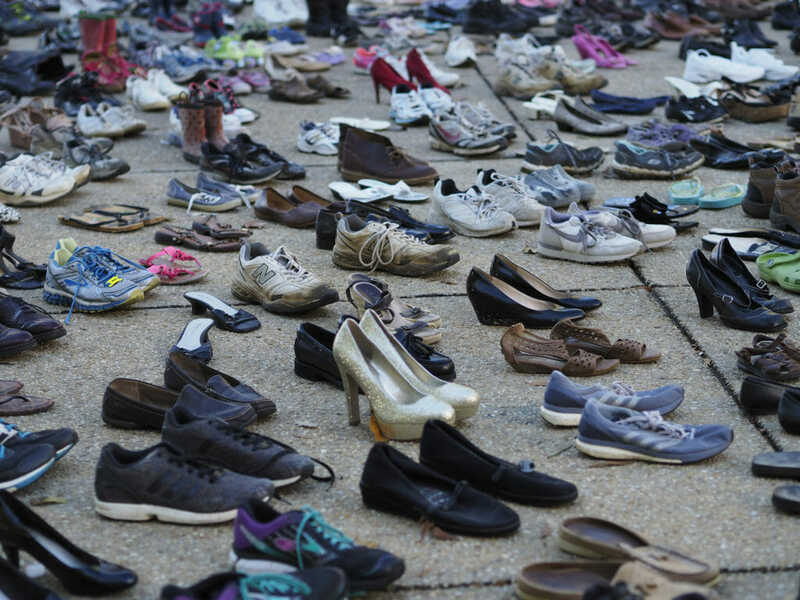 How many pairs of shoes will stand in front of the State Capitol next year? Help make people aware of this serious public health issue by donating old shoes for future exhibits. If your organization would like to partner with NC Vision Zero and host a shoe donation box, please contact us at ncvisionzero@ncsu.edu. 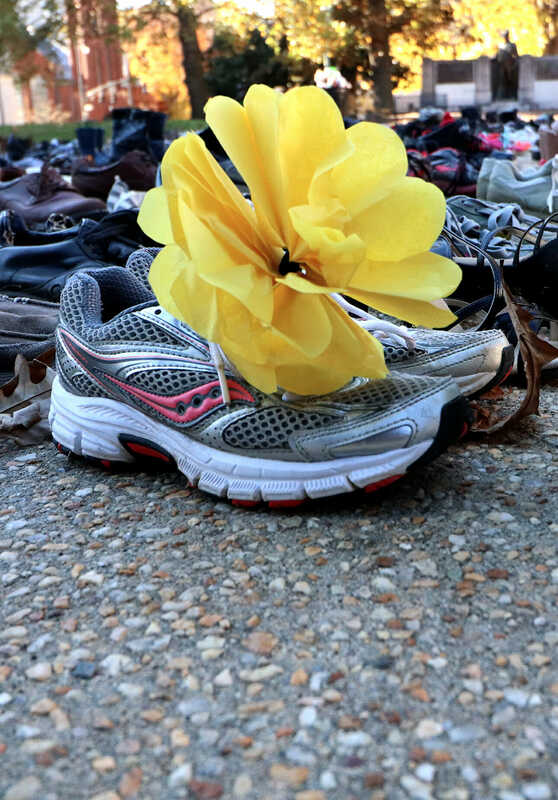 What will happen with the shoes after the World Day of Remembrance exhibit? The shoes will be used for many years, travel all over North Carolina, and appear at various traffic safety events. For example, we will use a portion of them for our upcoming Visionaries teen driver program–to represent the number of teen driver fatalities. If there is ever a day when we decide to stop using the shoes, we will donate the shoes that are still wearable. 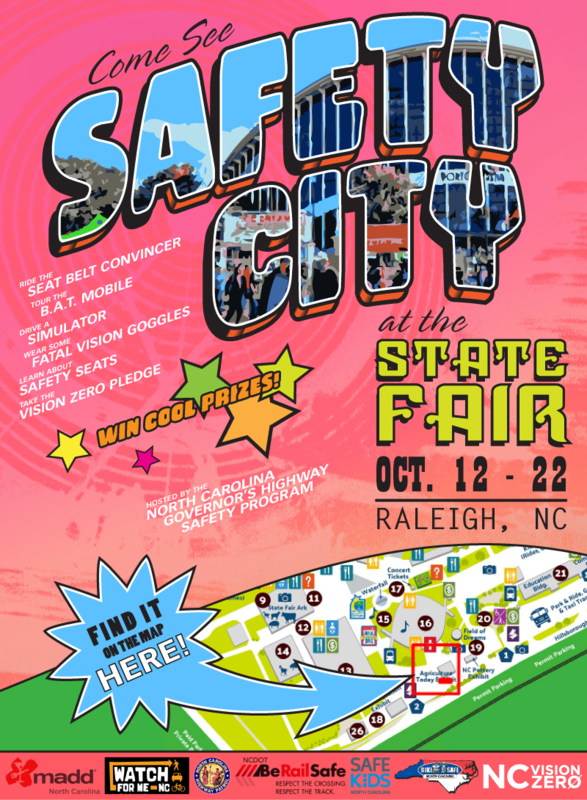 For more information, contact ncvisionzero@ncsu.edu. Transportation Secretary Nick Tennyson announced a new initiative championed by Governor Pat McCrory to eliminate roadway deaths in NC. NC Vision Zero seeks to bring together multiple agencies and stakeholders to engineer safer roads, educate all road users, and enforce life-saving traffic laws. Read more about the goals of this initiative from the NCDOT‘s press release. A recent study by NCDOT found that the intersections of synchronized streets reduce all crashes by 59 percent and fatal and severe injury crashes by 88 percent. A recent survey finds that nearly 92% of North Carolinians are buckling up and regularly using their seat belt. The Greenville City Council has approved a resolution to consider adopting Vision Zero to reduce pedestrian fatalities and to become the first NC Vision Zero Community. Read more from Reflector.